Let′s participate in Christmas charity fair! Christmas time is a period of the year when everyone can become a wizard and share miracles with others. 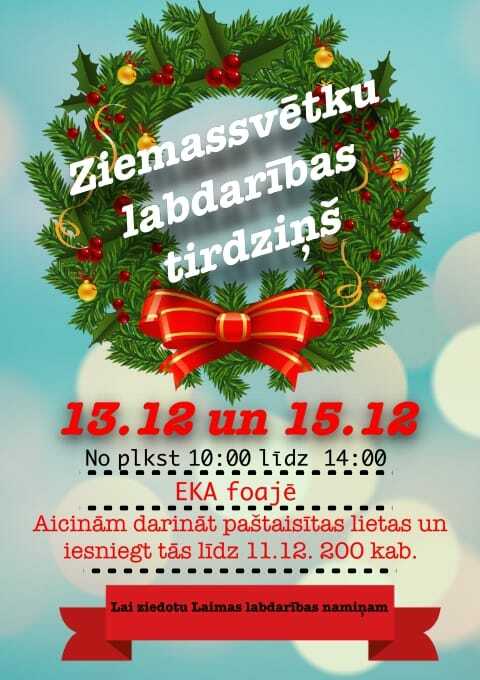 Therefore, EKA’s Student Council is organising a Christmas market on 13th and 15th of December. Money earned during the event will go on charity to Laima Charity House. We invite everyone to bring their homemade things – handcrafts, jam, cookies or any other items that can be offered for sale at our Christmas Market. Please bring your item to EKA Student Council’s office (room No. 200) or to the rectorate (we will give it to the STUCO) until December 11. Everyone is welcome to participate at EKA’s Christmas Market on December 13 and 15 and possibly right there you will find gifts for you relatives and friends!